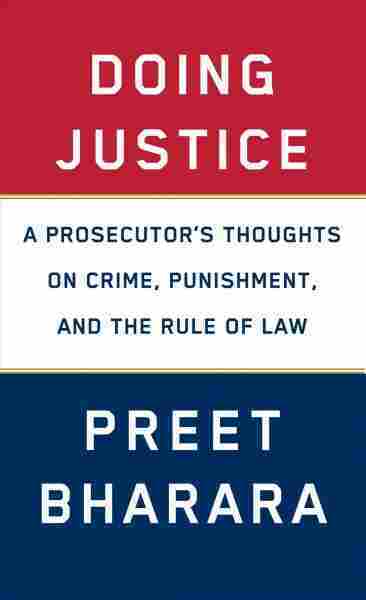 Fired By Trump, Preet Bharara Describes The Justice System He Served In an interview, former U.S. Attorney Preet Bharara talks about his new book, Doing Justice, and weighs in on Robert Mueller's probe and on how executives have been able to avoid criminal prosecution. 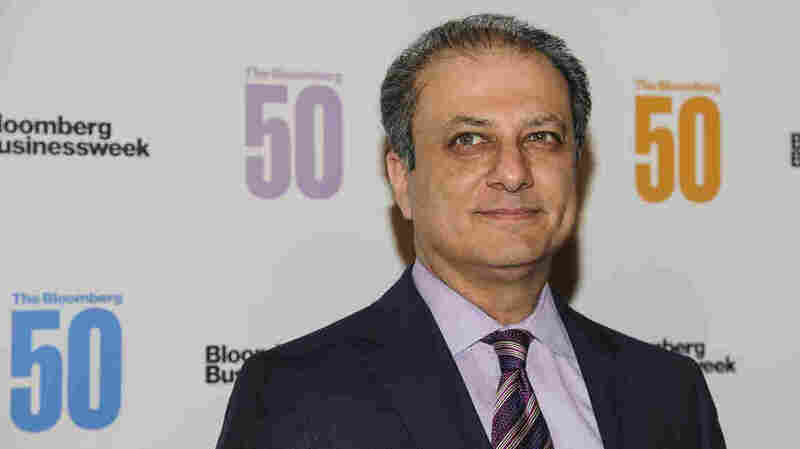 Preet Bharara attends The Bloomberg 50 in New York City on Dec. 4, 2017. In an interview with NPR, Bharara says that while our system has flaws, he supports it. He also talks about how executives have been able to avoid criminal prosecution, about how he became a symbol through social media in Turkey and about Robert Mueller's investigation. Bharara says people should be prepared for the possibility that Mueller may find no criminal activity by the president that Mueller feels he can prove without a reasonable doubt — and that "if that is the conclusion of Robert Mueller, I'll say, so be it." The person at the top often has plausible deniability. "You know, I didn't tell you to defraud anybody." There were also many occasions on which a financial institution would ask for the legal advice or accounting advice of a third party, and they would say, "Hey, will you bless this?" And in some cases, you know, maybe it was sketchy to bless something. ... It has been recognized throughout our system that if some independent third party says, "Yeah, we're the experts, we're the professionals, you can do this thing," you can make this disclosure and it's sufficient. You're never gonna get a jury, unless they're violating their oath as jurors ... to believe that the first person that relied on the advice had the intent to commit a crime. And that's true, by the way, for ordinary people who may have tax returns that they file and they say they relied on their accountant. And some people who say they relied on their accountant commit fraud and take deductions that they shouldn't. In retrospect, it seems to have gone very quickly. There were moments where it seemed to go very slowly. I have a chapter in the book where I talk about the verdict and what it's like, because I want people to feel what it was like to be in the office and to do the work, even though I think it's, they're universal lessons and applicable to everyone, you know. I say that the wait for a jury verdict is one of the most painful things you can do — obviously, the most painful for the person who's on trial, but painful and difficult for the prosecutor too — and one of the biggest cases we brought against [hedge fund manager and founder of Galleon Group] Raj Rajaratnam for insider trading, the jury was out 11 days. So those 11 days felt like seven years. But the overall seven and a half years, it's like your kids growing up — it flies by. I got a lot of criticism, sometimes for being too soft, sometimes for being too harsh. I'm banned from Russia by Vladimir Putin because we successfully prosecuted an international arms dealer named Viktor Bout. I was personally attacked by President Erdogan of Turkey because we prosecuted somebody that, you know, he had connections to in an indirect way. Reza Zarrab was a gold trader, Iranian, but also from Turkey, who was being prosecuted along with other folks in Turkey for various, you know, elements of misconduct, and those cases were made to go away because he was politically connected to two people who were close to [Turkish President] Erdogan. ... He exercised his power in a country that doesn't have the same constitutional protections that America has. He relieved judges of their duty. He removed prosecutors from office. He shut down media outlets. And the case went away — literally the case was made to go away. ... So Zarrab shows up in Florida. He's under arrest. It becomes an overnight sensation in Turkey, because, you know, much of secular Turkey saw this as an example of American justice that can survive and work and prevail, even when Turkish justice would not. People should have a lot of faith in Robert Mueller. I have a ton of faith in Robert Mueller. I think, you know, he is not a deity and he should not be put on a pedestal, but there's no one I can think of in the country who could have done this job as honorably as he's doing — and even he has been attacked and dragged through the mud, and false accusations made about him. What I'm saying is he's just a law man acting by the book, trying to do what he thinks is correct with a band of really, really smart, I think, honorable people around him. But if people think that America will be healed or America will be better or these dangers to democracy will be fixed if Bob Mueller recites chapter and verse a lot of misconduct on the part of the president, then they're mistaken, because even if he does that, it goes to the Congress, and Congress has been fairly supine. Mia Venkat and Steve Mullis produced and edited this story for broadcast. Lindsey Feingold contributed to the Web story.